Goal: connect 2 (or more) wifi area’s. For viafrica.org I studied the possibility of connecting wifi area’s within a tight budget. Area 1: location with an internet connection (dsl), with a wireless Access Point (AP) doing dhcp for clients in area 1 (i.e. a school-area). Area 2: another location (i.e. another school-area) having an AP far beyond the normal reach of the AP with internet at Area 1, doing dhcp for clients in Area 2. 2 fresh cans of fresh pringle chips. bolts, nuts, wire and other little stuff available at the local electronics hardware store. But keep on reading, it shouldn’t make too much off a difference. And when I have all parts of course I will try to use the cans and report my experiences back here. The problem is clear: Area 2 is too far from Area 1 to reach the AP at A1 and gets it dhcp-clients connected to the internet. You can extend your wifi network by placing intermediate routers which function as a bridge or repeater but we don’t know how far our area’s are apart and we are not in a situation we can just put Linksys routers where we want them. 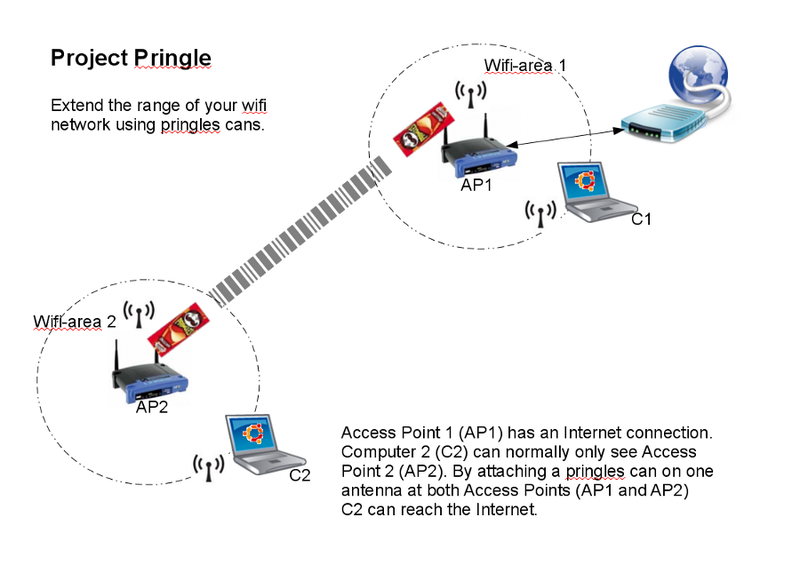 So this is were the cans of pringles come in: normal wifi-antenna’s have a reach of only dozens (30 – 40 meter?) of meters because the signal spreads all over the place. With the cans you can direct the waves to go one direction: to the other AP. This way the reach is much further. How far, depends mostly on clear sight: putting the equipment on rooftops is a good idea. AP1 = Linksys WRT54GL with dd-wrt firmware V24. AP2 = Linksys WAP4G with dd-wrt firmware V24. There are many ways of linking up routers and so extend your wifi area. The method you choose depends on what you really want. connect the other area’s to the internet connection we have at wifi-area 1.
do not change the dhcp connection setups we already have at all Area’s, no client-PC (re)-configuration should ne needed. firmware does not give much flexibiliy. For the olsr experiment (see What a mesh!) I used the FreiFunk firmware. Freifunk is a derivate from dd-wrt and for this project I installed the latest dd-wrt firmare (V24), which enables lots more possibilities. More on the dd-wrt firmware install at http://www.dd-wrt.com/wiki/index.php/Installation. Now let’s have a look at some possible setups to achieve our goals. I discussed the usage of OLSR in a previous tutorial (see What a mesh!). Altough it works quite nice I don’t want the clients to be reconfigured for running an olsr daemon. So, although it should work olsr is not used. Disadvantage of using AP2 as a “standard” bridge (Client Bridge mode) is it only allow wired clients to connect. But as of firmware V24 you can put the device in “Repeater Bridge” mode which also allows make a wireless connection using DHCP. This seems a mode we are looking for, so let’s start configuring it! We keep AP1 as our primary AP in normal AP mode, connected to the Internet. We turn AP2 into a Repeater Bridge and use the pringles cans to connect with AP1. Also, in Repeater Bridge mode, AP2 still allows clients in wifi-area 2 to connect using DHCP. The obvious question is: will these clients be able to reach the internet? To setup AP2 in Repeater Bridge mode I followed the steps a described at http://www.dd-wrt.com/wiki/index.php/Repeater_Bridge (especially the image is very handy). I will repeat these steps here. At first configure the AP’s without setting security parameters. We first want it to just work. install latest dd-wrt firmware (see http://www.dd-wrt.com/wiki/index.php/Installation. reset to factory defaults (Administration -> Factory Defaults). configure WLAN to get your internet connection (depending on your provider probably either static IP, DHCP or PPPoE). Assign WAN Port to Switch : Optionally enable this to use the WAN port as another LAN port (for wired connections). So now we can test the configuration by connecting with a laptop to the network “nopringlesyet”. Because I was in range of both networks I could connect to both networks (“area2” and “nopringlesyet”). And with both connections I reached the internet! I either case I got my IP-address with DHCP from AP1. So, this works really nice. Now it’s time to strengthen security and preprare my pringels cans. I almost have all the equipment (cables, connectors etc..) to start experimenting with the real pringle cans. But I need some sort of powersupply outsite to check long distances…. update soon (?)!! "Man who sneezes without tissues takes matters into his own hands."